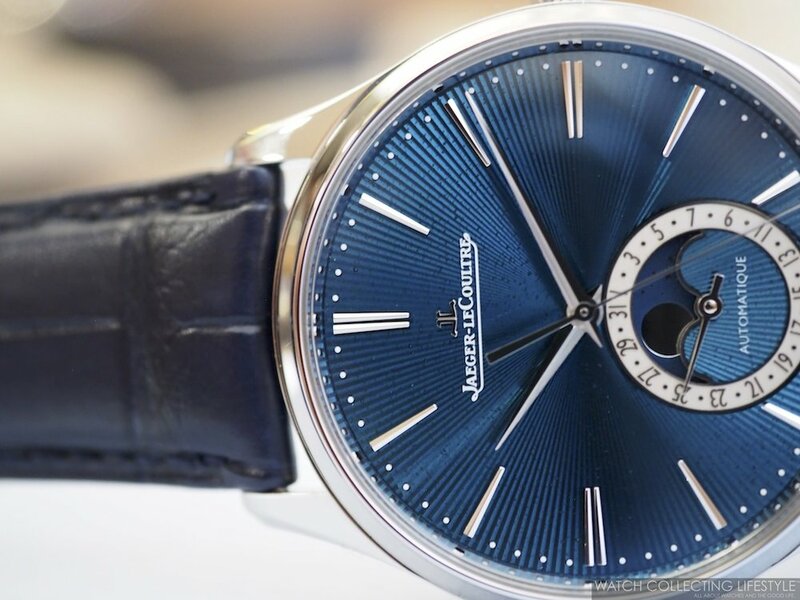 SIHH 2019: Jaeger-LeCoultre Master Ultra Thin Enamel Dial Limited Editions. Live Pictures & Pricing. New for the SIHH 2019 are three Jaeger-LeCoultre Master Ultra Thin watches with blue guilloché and enamel dials. A new Master Ultra Thin Tourbillon, a Master Ultra Thin Perpetual Calendar and a Master Ultra Thin Moon phase watch enrich the ultra thin collection with the most emblematic complications in watchmaking. Showcasing Jaeger-LeCoultre’s expertise in the field of horology, these new dials are a testament to precision and sophistication. All cased in 18K white gold cases and exclusively available in limited editions, the three new watches feature a midnight blue —blue greenish depending on lighting conditions— enamel dial with sunray guilloché motif. Before going in detail into each of the new watches, it is important to mention that the watches we perused and photographed are not the final product. The watches we have here are prototypes with some blemishes and texture issues on their dials. The final watches delivered to clients will be flawless per Jaeger-LeCoultre standards. The new Jaeger-LeCoultre Master Ultra Thin Tourbillon Enamel features a new tourbillon movement and a new-look date counter. They form a balanced pair on this watch, produced in a limited series of 50 pieces. In an elegant case from the Master Ultra Thin collection, the famous Jaeger-LeCoultre Caliber 978 has been re-conceived both technically and aesthetically. In terms of finishes, the sunray effect really stands out, as does the light and graceful gold oscillating weight. As always, one’s gaze is captured by the endlessly fascinating spectacle of the tourbillon, fittingly placed in an aperture at six o’clock. Case: 40 mm in diameter by 12.13 mm in thickness in 18K White Gold. Water resistant to 50 meters and fitted with a display case back. Movement: Automatic JLC calibre 978F with a power reserve of 48 hours. Dial: Blue guilloché enamel with engraved date counter. Strap: Black alligator strap with folding clasp in 18K white gold. With its four internal apertures that are the embodiment of watchmaking complications and a blue enamel guilloché motif, the new Jaeger-LeCoultre Master Ultra Thin Perpetual Enamel asserts itself from the very first gaze. This ultra-thin piece has seen a re-imagining of its famous Jaeger-LeCoultre Caliber 868, one of the most emblematic of the Grande Maison. Both inside and outside its case, this new interpretation has all the hallmarks of exclusivity, as can be seen by the 100-piece limited edition. The new and original display of its perpetual calendar —day at 3 o’clock, date at 9 o’clock, month and year at 12 o’clock—, simultaneously indicates the moon in both the Northern and Southern hemispheres. In a starry sky that has been delicately polished, the moon phase is housed in a disk at 6 o’clock. Enhanced by a new design, including an engraved counter that immediately attracts the eyes, it sets itself in motion thanks to its different phases, waxing or waning. Just like the two limited editions from the same family, the Master Ultra Thin Perpetual Enamel watch sets itself apart with its refined and lengthened hour-markers. Their stretched-out silhouette elegantly blends in with the guilloché blue enamel dial. Completed by hand at the Jaeger-LeCoultre Manufacture, this artistic work enhances the functions on this model, where a concern for ergonomics is visible to the naked eye. The intense and luminous blue of the new and perfectly geometrical guilloché dial goes well with the deep blue of the matching alligator strap. Case: 39 mm in diameter x 10.44 mm in thickness in 18K White Gold. Water resistant to 50 meters and fitted with a display case back. Movement: Automatic JLC calibre 868A/2 with a power reserve of 70 hours. 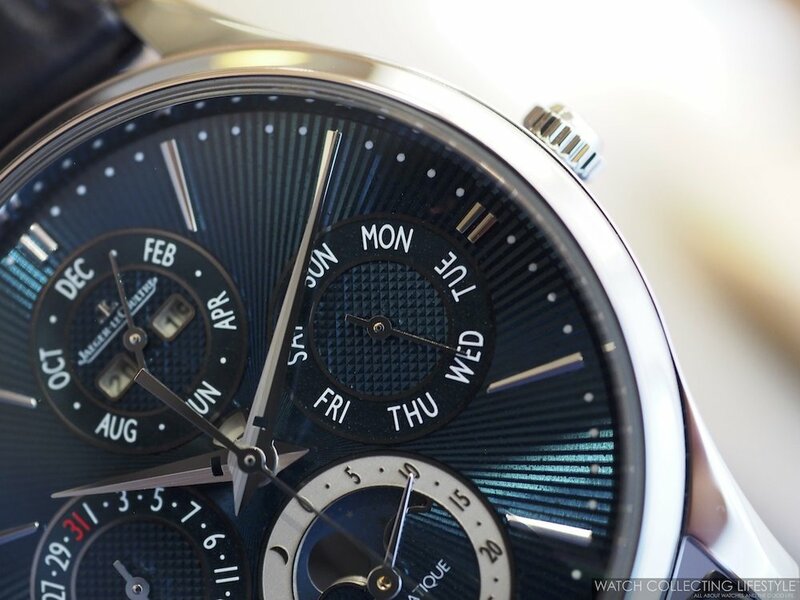 Dial: Blue guilloché enamel with engraved moon phase counter. Sticker Price $55,000 USD. 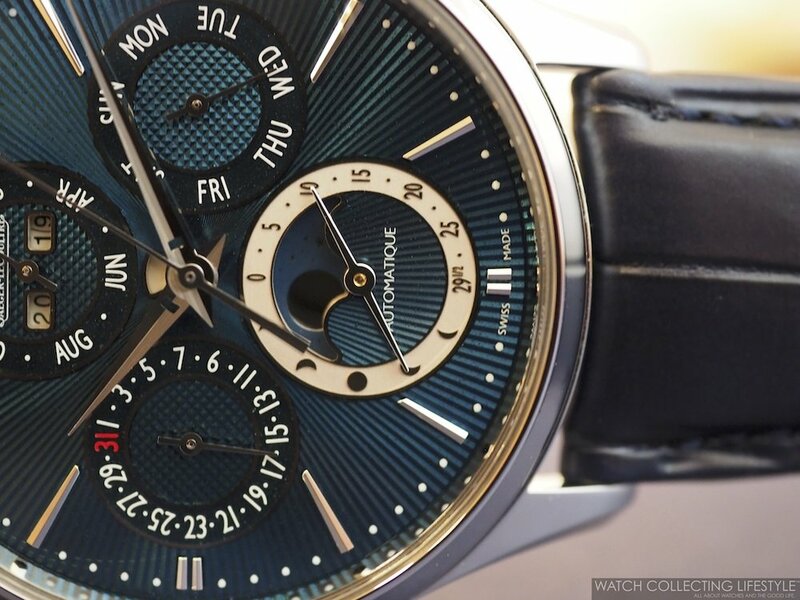 For more info on Jaeger-LeCoultre click here. which translates directly into a new hand-guilloché blue enamel dial, new hour-markers, a new polished moon, and a new engraved counter. Its extremely thin case in white gold (10.04 mm) conceals its engine, the Jaeger-LeCoultre Caliber 925, an automatic mechanical movement with a 70-hour power reserve. Case: 39 mm in diameter x 10.04 mm in thickness in 18K White Gold. Water resistant to 50 meters and fitted with a display case back. Movement: Automatic JLC calibre 925/2 with a power reserve of 70 hours. Dial: Blue guilloché enamel with engraved date counter at 6 o’clock. Sticker Price $35,800 USD. For more info on Jaeger-LeCoultre click here. 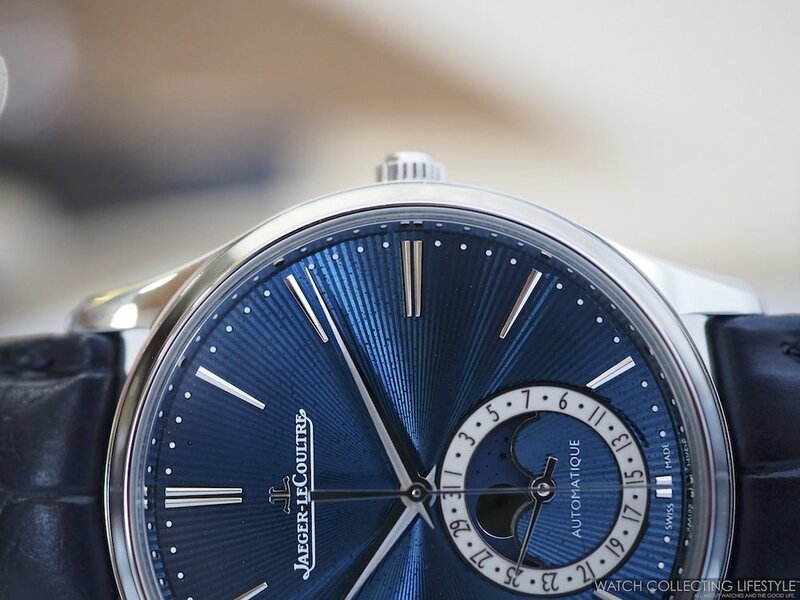 Posted on January 30, 2019 by Editor & Publisher and filed under Jaeger-LeCoultre, SIHH 2019, SIHH and tagged Jaeger-LeCoultre Jaeger-LeCoultre Master Ultra Thin Enamel Jaeger-LeCoultre Master Ultra Thin Moon Enamel Jaeger-LeCoultre Master Ultra Thin Perpetual Enamel Jaeger-LeCoultre Master Ultra Thin Tourbillon Enamel Tourbillons Moonphase Watches Perpetual Calendars Mainstream Brands 2019 SIHH SIHH 2019 Most Popular.